Norway: My favorite quarry, a small gneiss quarry used for the Selja medieval monastery at the westernmost part of the country. From fieldwork with the Directorate for Cultural Heritage of Norway, Photo: Per Storemyr. I really do appreciate your loyalty and I hope to be able to write more articles for you about stone – about quarries, monuments and rock art – in 2014 than I did in 2013. In the year that is soon coming to an end I had to focus on various projects and writing for other media than the internet. Many of the great places that I visited and worked at in 2013 may certainly turn up in future blog posts, so I hope you will continue to follow my writings in 2014. As for now, here’s a cavalcade of images from some of the quarries, monuments and rock art sites that touched me over the past twelve months. They span all of history from the Mesolithic to the Early Modern era. Enjoy the slide show! Egypt, or rather the British Museum. For various reasons I take a keen interest in the Wadi Hammamat greywacke quarries. This is one of the beautiful objects made from the stone, part of a sarcophagus-lid of the Vizier Sisebek, from the 26th Dynasty, about 600 BC. Photo: Per Storemyr. Norway: This is also a way of protecting wooden churches! Slate at the facades of Dovre church in Central Norway. Photo: Per Storemyr. UK: Since I’m fond of Purbeck marble, I just had to visit Temple Church in London. Well, it was destroyed during the war, but reconstructed with the medieval array of Purbeck marble columns. Photo: Per Storemyr. Mesopotamia, or rather the British Museum. Soapstone (or rather chlorite schist) vessel brought in from Iran in the middle of the third millennium BC. Photo: Per Storemyr. Egypt, or rather the British Museum. The famous “Hunters’ Palette” from the Late Predynastic period, late fourth millennium BC. It is made from the schist/greywacke quarries in Wadi Hammamat, a place that I tend to take an interest in at the moment. Photo: Per Storemyr. Switzerland: Transportation of heavy goods is always of interest to a stone researcher. Here’s a reconstructed model of a Roman cargo ship displayed at the Vindonissa museum in Brugg. Photo: Per Storemyr. Norway: Stone Age reindeer rock art at the Hell(!) site near Trondheim. Photo: Per Storemyr. Switzerland: Roman millstone displayed at the Vindonissa Museum in Brugg. Photo: Per Storemyr. Switzerland: Close to where I live in Brugg there are many millstone quarries that were originally opened in the Roman period. This is part of the deteriorated Villnachern quarries, where they went underground in the early modern era. Photo: Per Storemyr. Norway: The west coast of the country is dotted with Bronze and Iron Age burial mounds. Here’s a very impressive one from the westernmost part of the country, at Raudeberg in county Sogn og Fjordane. Photo: Per Storemyr. Norway: A big elk at the rock art site at Kåfjord, near Alta in the northernmost part of the country. This is a place where I carried out weathering and conservation studies with the Alta Museum in 2013. Photo: Per Storemyr. Switzerland: A lost block of sandstone along a beautiful hollow way leading from the quarries at Gurten near the capital Berne. Photo: Per Storemyr. Norway: The Melsvik Mesolithic chert quarry in Northern Norway. Excavated in 2012-13, this is the place where we could show that quarrying was undertaken with the aid of fire setting. Fieldwork with Tromsø Museum. Photo: Per Storemyr. 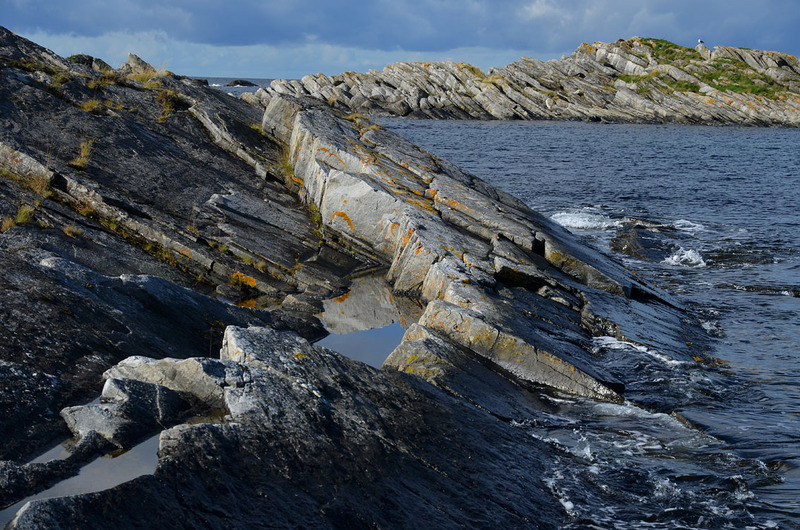 Norway: Looking for marble quarries along the stony beaches in the northern part of the country. This work was part of a great workshop at the Gildeskål medieval church. Photo: Per Storemyr. Norway: Rissa 19th century church in the central part of the country. Made entirely from local granodiorite gneiss. Photo: Per Storemyr. Switzerland: The roofs of medieval churches were made in from many different materials, most often wood shingle. Here’s an example from Sogn Sievi in Brigels, Canton Graubünden. Photo: Per Storemyr. Norway: Rein medieval abbey in the central part of the country. Remains of floor slabs made from local gneiss from the abbey church. Photo: Per Storemyr. Norway: Reconstructed Iron Age grave chamber in a burial mound in Gauldal, near Trondheim in the central part of the country. The mound is part of the great cultural path made by “Horg Bygdatun”. Photo: Per Storemyr. This entry was posted in Ancient Egypt, Archaeology, Norway, Old quarries, Rock art, Switzerland and tagged Ancient Egypt, Cultural heritage, Norway, quarry, rock art, Switzerland. Bookmark the permalink. Thanks Per, a Wonderful Rocky Journey! A truly enjoyable way to start the new year! Thanks! A great 2014 to you too, Alain!